There are some things that really only work out when you start early. Flexibility, for instance. Now it's probably not impossible to become flexible when you're older because, as they say, with enough practice and stretching, anything is possible. But I can envision some sort of not worth it stage, where your bones have stiffened and you can hardly walk, where stretching out into a split is more likely to tear some sort of vital muscle than turn you into the ballerina you always wished you were. But before I digress further, what I’m really trying to talk about is skin care. I've been blessed with good skin throughout my life that has generally been clear and even toned, but my time of not needing to moisturize or heck, even cleanse my face, is running out. I'm talking noticeable creases around my mouth and eyes and semi-frequent monthly break outs on my forehead. Friends have actually started commenting about my skin's steady deterioration so it's really about time that I started doing something about it, lest it becomes too late and all that can save me is a face lift or Botox lolol. After 3 days of the skin care routine. You can still see some spots and redness but it was worse beforehand. Rather than start out small, I thought, okay la, let’s do this properly. If we’re on the topic of skin care, no one does it as well as the Koreans and I decided to embark on the journey of.. I used the Natural Pacific Perfect Deep Cleansing Oil for my first step which involved me slathering it on to my face and leaving it there for about a minute, rubbing in some water in to foam it up, and rinsing it off! Pretty straightforward and probably the most familiar step for those who cleanse on a regular basis. So this double cleanse is a cornerstone of Korean skin care, because being Asian and competitive, ONCE IS NEVER ENOUGH. The cleanser we’re meant to use for the second step is a water cleanser which I suppose is milder and leaves my skin feeling clean but not too dry. This is probably one of my favourite steps and all I have to do is soak a cotton pad with the solution, and wipe my face with it. Rub from inwards to outwards and don’t be too sparse with the cotton pads (it’s okay to use more than 1!) else you might end up just distributing your gunk around your face. Exfoliating is probably one of my least favourites because I never know whether I’m being too rough with my skin. So, Korean skin care necessitates that we rub off those dead ol’ skin cells which will make the moisturisers to come more effective! Before this, I always presumed toners were something related to the colour tone of your skin. But, well, it’s not hahaha and toners are meant to balance the pH levels of your skin and like exfoliating, also helps in the absorption of all the good products to come. The toner I’m using is the Beauty Water which feels amazing! Use a cotton pad to swipe it across your face for the most shiok tingling sensation across it. It’s so quick to do, but the feeling afterwards makes me feel like I did something complicated and important for my skin. To combat the early onset of wrinkles, I’m using Leaguertox V-Shot Silhouette Lifting Ampoule as a lifting ampoule which has instant results! This one is pretty cool where a little goes a long way and instantly lifts up my face. So I put some under my eyes and by the corners of my mouth and jaw, massage it upwards and it’s like an auto face-lift. What the gel does is that it kinda turns sticky once rubbed in and holds my face in place? Which I guess would be useful when I’m asleep so my face sort of “sets” in a not saggy way. Over the years, I’ve collected a variety of moisturisers from my half-hearted attempts at keeping my face supple over the dry winter months in UK. I never diligently used any of them but now that I’ve started trying to care for my skin properly, I’ve been playing around with a range of moisturisers. Haven’t found my go-to yet but I love how no matter what, I wake up with my skin feeling soft. I found this very difficult to follow on a daily basis because it’s so over-the-top! Sheet masks have always felt like a treat to me so it seems a bit indulgent to do it every day, and I find myself giving this a miss every 2 days. But, if you really think about it, it’s only about RM3 per mask, so if it makes you feel like a queen, then by all means, it’s a small price to pay for royalty! If you’re a first timer like I was, all of the above can sound a little overwhelming. My products came from a variety of brands and making an investment on things you don’t really know how to use can be intimidating. However, knowing what the 7 steps entail means that you know what you’re looking out for. More often than not, you probably already have some moisturiser lying around, a cleanser that you’re already using perhaps or even some exfoliating cream. Just put them all together, supplement the missing steps and you’re well on your way to starting on 7 steps. If you have no idea where to start, my products were all from Althea, a Korean-Malaysian shopping site for Korean beauty products. 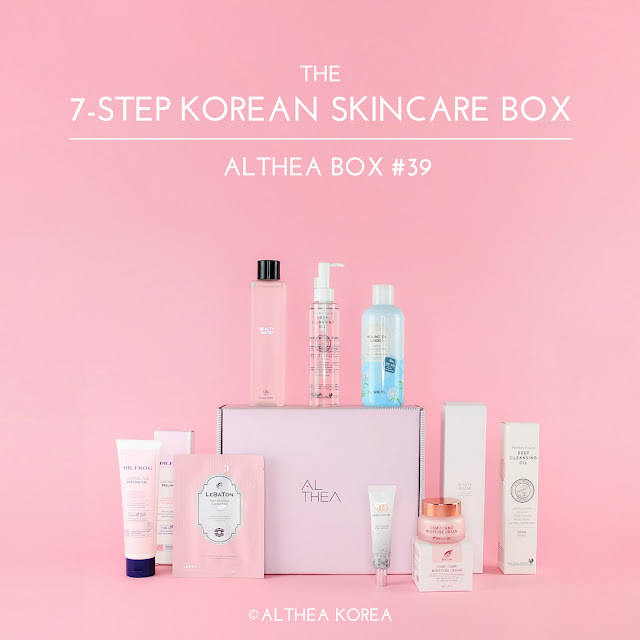 Whilst they do sell most of the items individually, they periodically issue Althea Boxes which put together a collection of skin care or beauty products all in one box. I had the chance to review the 7-Step Korean Skincare Box which was absolutely perfect for a beginner like me because it pretty much sourced all the different products I needed and is much more affordable than getting the products on their own. The box itself is sold out right now, but you can still get the items individually if you wish to. I’ve starred the ones I personally found amazing to use so definitely check those out. P/S: Minding Money Tip: 15% off for first time customers! Just as a general remark, I really recommend these Althea Boxes because they come at good price points and from what I’ve seen, include full sized products so you won’t have to worry about not getting your value for money. It’ll make a great gift for your girlfriends, your mother or even yourself. I had so many questions when I first started this like do I have to wait between each step? How much time is this going to take? And ultimately, is it worth the effort?? For the first question, it’s recommended that you allow the product to set in before you apply your next one. So maybe a minute between each? When I first started, it took me 30 minutes to go through the whole procedure, excluding the sheet mask. Now that I’ve gotten used to it, it takes less than 15 minutes, and can be a really therapeutic way to end the day. I’ll confess that I’ve given it a miss every now and then, but will at least try to water cleanse, toner and moisturise if I can. This has done wonders to making me feel more adult and when I got a really strong tan after my recent trip to Australia, very quickly lightened me back to my slightly-less-tanned-but-still-tanned self. The best part of this is really just feeling like I have cleaner and healthier skin. My recent period came and went without any major breakouts and whilst I still haven’t returned to the baby skin days of the past and don’t know if I ever will, it’s doing a lot better than it did prior to this! All in all, it’s a commitment worth sticking to and I’ll do my best to keep at it! Thanks again to Althea.kr for the sponsored box. As usual, I’m not being forced to say nice things and I’m only saying it if I mean it. Tiffany x Caffe Bene: Ultra Violet Sweet Potato Series Party! I don’t think I’ve ever had a post so colour themed, so if you’re into purple, then you’re in for a treat! K-culture blew up as I was a high school student, and I can still vividly remember when bingsu hit our shores (I guess it arrived with a Big Bang ;)). In fact, the first one I tried was at Caffe Bene, and I remember glorious toppings of chocolate ice cream and chunky brownies, so I guess you can say that we’ve had a pretty good relationship. But if you haven’t met bingsu yet, here’s an introduction for you: bingsu is pretty much the millennial ice kacang, which puts it squarely in the realm of being very Instagrammable. 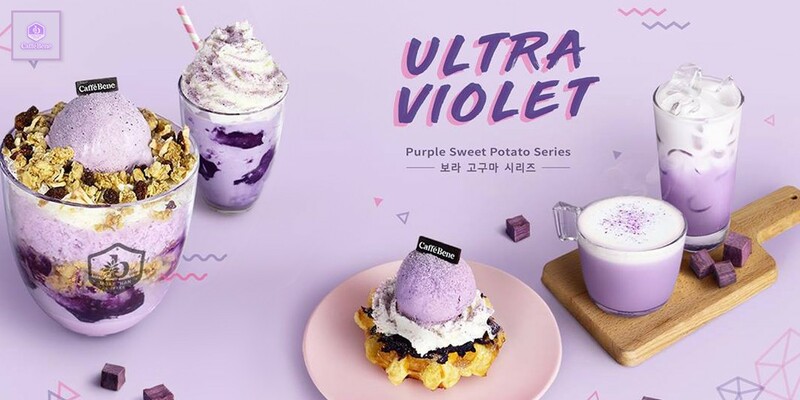 I was recently invited for a party with the Butterfly Project at Caffe Bene to sample their new seasonal range: Ultra Violet Purple Sweet Potato Series. No prizes for guessing what the dress code was though I have to say, I never thought I’d ever try dressing up for a party to match the food being served. The event was held at the One Utama outlet which is a beautiful two story store tucked away in the Old Wing, and the first of the Caffe Bene outlets to feature its modern, newer industrial look. With a focus on “more than coffee”, Caffe Bene is positioning itself as a everyday hang out especially for its new outlets in One Utama and Mid Valley, equipping its stores with story books, plug points and wide tables. If natural lighting and a comfy seat is your cup of tea, you’ll be happy to spend hours at Caffe Bene. Caffe Bene shared with us that the idea behind a sweet potato series was multi-pronged. On one hand, pastel purple is just so aesthetic and as the Pantone colour of the year, it only seemed fitting. On another, they equated sweet potatoes with the comfort food of the generation before ours, and conjured up images of young teens taking their parents to try bingsu (which is traditionally not something older people would have), but with a flavour that would be familiar and resonate with them more than, say, chocolate or Matcha. Meet the cast of characters: the latte, bingsu, Frappeno and my personal favourite..
Ultra Violet Sweet Potato Cream Waffle (RM18.90) - Vibrant purple sweet potato paste layered on top of Caffe Bene signature Belgium waffle, crunchy granola, topped with seasonal purple sweet potato gelato and dusted with some purple sweet potato powder. Hahah look at the adoration the waffle’s receiving! Ultra Violet Sweet Potato Bingsu (RM29.90) - This ultra violet icy treat is built up with layers of shaved ice, purple sweet potato milk base, crunchy granola, bouncy agar jelly and topped with Caffe Bene’s seasonal Ultra Violet Sweet Potato Gelato. You can eat bingsu in one of two ways: (1) press down on the ice cream and mix everything up so all the flavours are combined. The ice keeps the ice cream from melting too much and you get a creamy, almost McFlurry like concoction; or (2) eat it layer by layer but get left with some layers of just ice in the middle. Caffe Bene recommends doing it the first way but since people like monstrosities like deconstructed cheesecakes, I’m sure some would prefer the second. Whatever floats your boat, man! The bingsu was the most photogenic of the bunch and found itself the star of many photos. But as beautiful as it was, I think you’ve got to be a fan of sweet potato to really appreciate this. It had a very generous chunk of sweet potato paste in the middle but I was honestly more interested in the jelly pieces than anything else in the dessert. On the plus side, it wasn’t too sweet and we made it all the way to the bottom of the bowl. I didn’t try the Frappeno so here’s the press release description: The perfect icy drink for a hot summer day. Ice blended purple sweet potato frappeno, topped with whipped cream and sprinkle of purple sweet potato powder for that finishing touch. This was comforting and tasted nothing like a latte I’ve had before. Because it was so creamy, it was almost like Nestum or oats. I didn’t taste the sweet potato in this one at all, but Xinaday gulped it down and said she really like how much it tasted like sweet potato (???!!!?) LOL maybe my palette isn’t cut out for food tasting if I’m missing notes like these but hey ho! The series will be here till 15 April 2018 so you have about a month to try these ultra violet beauties. You should try it if.. If you want to try the desserts, but you’re watching your wallet, here’s my Caffe Bene Minding Money tip for you: go on Wednesdays! Depending on the hour you go, you’re entitled to different discounts for different items from the menu. Caffe Bene and the Butterfly Project for the fun party! I took home a fun goodie bag with gifts from MAISON de gigi, JUICY Fresh Juice Bar and Caffe Bene Premix Coffee. Special shoutout for this tube of Barbeque Flavoured Popcorn! Best prepackaged popcorn I’ve ever had! I honestly had good intentions about bringing some to work to share but it was so good, my family (okay, mostly me) finished it in less than a day. If you find it, it’s a must try! I hardly ever enjoy savoury snacks but this was a 10/10. Anyway, it should go without saying that all the views here are my own and no one is forcing me to say nice things about them. If I’ve said nice things, it’s because I mean it.